A watertight plastic container minimum size 6” x 4” and 2” deep (ice cream and margarine tubs, etc are ideal). If the lid is tight fitting please ensure you put some small air holes in the lid. Small amount of porridge oats/ready brek. Small packet of dry yeast. Q-tips or child’s paintbrush for removal of worms as they crawl up the side of the container. 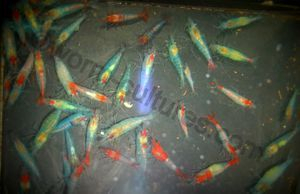 Micro worms are an excellent live food for fish fry and are very easy to raise. Micro Worms are white in colour and grow up to 3mm in length. You will need a container with a lid, for example an ice cream tub. You can use whatever you want; it just needs to be waterproof. The worms need to breathe, so if the lid is airtight, put some small holes into the lid. If the cover fits loosely, then there is no need for the holes. Micro worms are easy to see you can see a shimmering on the surface of the culture media. Micro worms are a good first food for bigger fry, or as a second food for smaller fry. First, add about a ¾ inch or so of dry porridge oats. Then add water, tap water is fine, and mix it all together so it is sloppy, but not watery. I found a fork the easiest to use. Next, add a pinch or so of dry active yeast to the top of the cereal. The micro worms feed off of the yeast. Lastly, spread your micro worm starter over the top of the culture medium. If it is dry, add a touch of water to make it easier to spread. Be careful to not make it watery though. 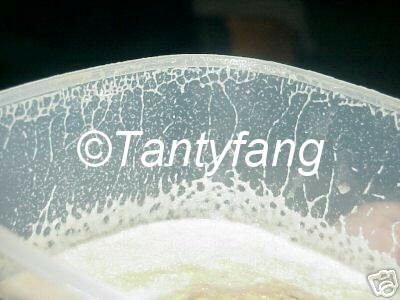 Within 3 – 5 days you will see the worms climbing up the sides of the container. To feed them to you fry, simply wipe them off and swish them into the tank. They will live for about 6 hours in the fish tank, so do not over feed or they may die and dirty the water. These can usually be kept going for 3 to 4 weeks. If the culture gets watery, add some more baby cereal or oatmeal (whatever you are using). When the culture starts to smell bad it's time to start a new one. Simply follow the steps above again and add a spoonful of your old culture to the new one. Micro Worms can be used as a substitute or an addition to baby brine shrimp. If you only have a small amount of fry and don't want to go through the hassle of hatching baby brine shrimp every day, these can be a great alternative. If you have a large number of fish to feed, then I recommend you start at least one new culture each week so that as the first ones are coming to the end of their productivity, you will have another one that is ready to take it's place. As long as you keep this cycle going you will never again need to worry. The culture should be kept in a well lighted area at room temperature, 68-85°F. Micro worms can withstand temperatures below 32°F but greater daily production can be expected at higher temperatures; however, cultures last longer at lower temperatures. Here is an example of how a healthy White Worm Culture can look with the right care and attention.